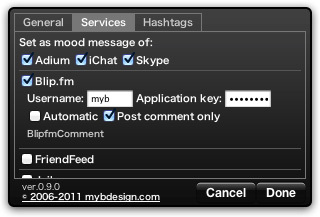 This dashboard widget automatically displays the name of iTunes song as mood message of Skype, Messages.app/iChat and Adium. And it is able to notify track information to Growl and to send mood message to Twitter, Blip.fm and FriendFeed. Uncompress the downloaded archive, and double-click "In the Mood.wdgt". If you have used Blip.fm with version 0.8.0, it is required you to get Application Key from http://blip.fm/settings/password and input it. Version 0.9.0 and later require Mac OS X 10.5 or later. Use pulldown menu on the front side to select mood message. You can configure some settings on the back side. 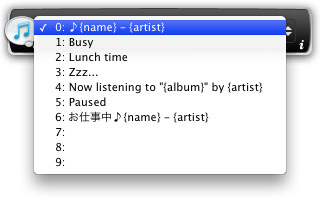 Turn on "Use when iTunes pauses" checkbox to select mood message that is displayed when iTunes pauses. 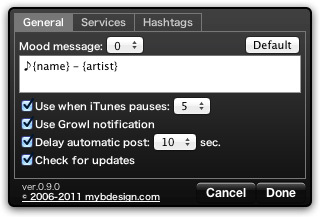 Turn on "Use Growl notification" checkbox to notify track information to Growl when the playing track has changed. Turn on "Delay automatic post" checkbox to delay posting after the playing track has changed. Turn on "Check for updates" checkbox to check for a new version of In the Mood automatically. In "Set as mood message of" section, turn on checkbox of application to display mood message. 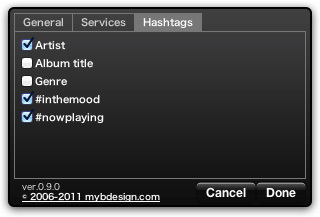 Turn on checkboxes beside each service names to send mood message. Input your account information into "User name" etc. Turn on "Automatic" checkbox to send automatically, or turn off it to send manually by "post" button on the front side. When you send mood message manually, you can add text before it. Turn on checkboxes and the hashtags will be added to the mood message when posting. © Copyright 1999-2014 Masayuki Iwai all rights reserved.